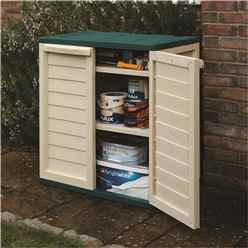 Our large plastic storage range consists of not only sheds. 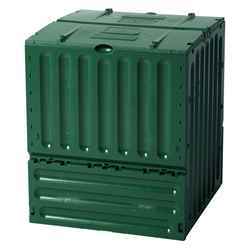 We have a plastic 600 litre composter which is made from Polypropylene. Virtually unbreakable and extremely long lasting. 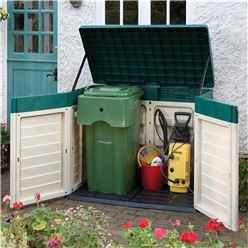 Featuring an easy and convenient way of adding and removing compost through the two large lids, one lid at the top for adding compost and a lid at the bottom for removing compost as and when you require. 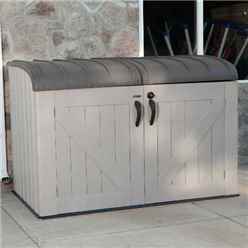 They are also easy assembly too – so easy, that you don’t require any tools to put it together. The parts simply ‘click’ together. 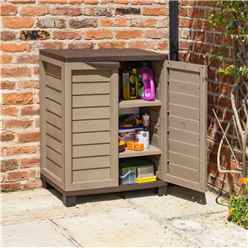 We have a 2’5” x 1’7” plastic cabinet, perfect for storing smaller garden accessories and also handy if you don’t have much room available for a storage shed. 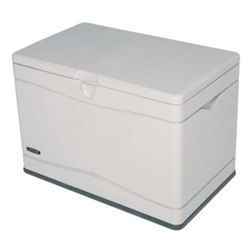 Plastic boxes are available which can be used for storage and use as a seating bench. Perfect for that extra seating place when you have visitors. 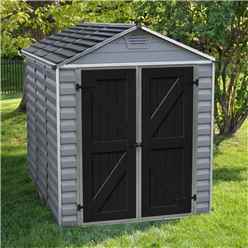 The plastic sheds themselves start at the 5ft x 3ft Deluxe Plastic Tall Shed. 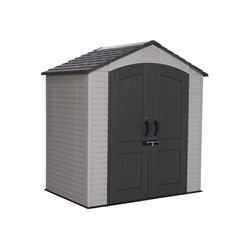 The next in line is the popular 6ft x 4ft Apex Plastic Shed. 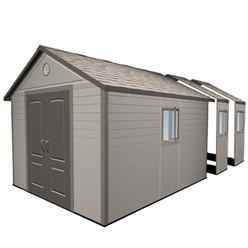 The sizes go all the way up to an 11ft x 26ft Duramax plus Plastic Apex Shed with Plastic Floor + 8 windows which features a coated steel reinforcement, steel bracing and is UV protected. 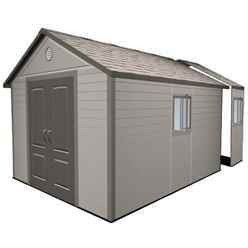 We have plastic sheds with a flat roof which are a great use as a lean-to shed to situate against another building, such as your house or another out-building. 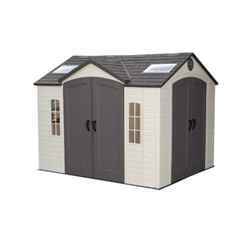 The other roof option is an apex roof which is a pointed roof – these are extremely popular. The choice though is purely based on what best suits your needs or your own personal preference. 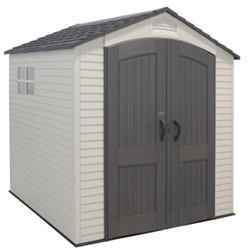 Our plastic sheds vary regarding window options. Some come with a window as standard, others don’t. 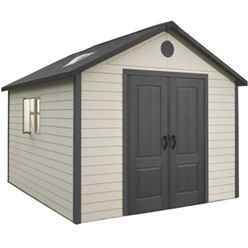 However, whether the shed you have chosen includes a window or not, Skylights are available as an additional extra for many of our plastic sheds. Skylights replace a roof panel providing you a window in the roof. Skylights are perfect for security reasons as not many people would be able to notice there is a window in the roof, let alone see into it. 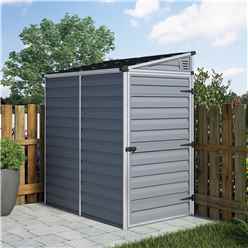 Yet still providing some daylight in to your shed. 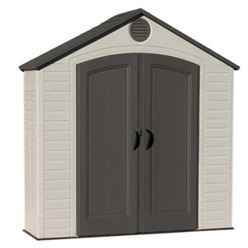 Most plastic sheds do not include a floor. 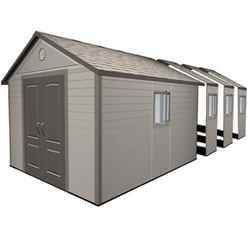 Whether the shed you like has a floor or not, we recommend you situate your new building on to a concreted or paved area. 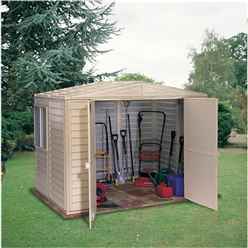 If your shed does not include a floor, we advise you anchor the shed to the ground using ‘L’ shaped brackets to secure the shed to the ground. It is easy to find what you are looking for on our website as we have put products in to different categories to help you narrow your search down. This saves you time so you are not looking at products of no interest to you. 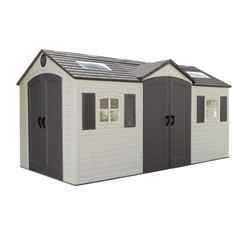 Simply click on ‘Plastic Sheds’ at the top of the page and then select the size you require. 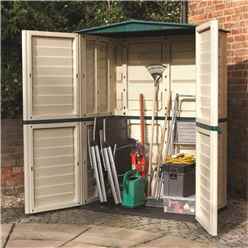 Alternatively, if you just want to browse through, just click ‘Plastic Sheds’ at the top of the page and browse. Our products are in price order, low to high. This also helps you find the item you want at your desired budget. Delivery times vary for each range of our plastic sheds, some being available within 48 hours, other ranges taking 5 working days, some of the larger buildings taking 15-20 working days. You will however always be advised of when you can expect the delivery of your goods, we will never turn up unannounced. Delivery times are all day, between 7am and 7pm. Dependant on the courier used, we can sometimes request the driver calls you when they are on their way to you, other couriers cannot call when on their way but if you are not home to receive your delivery they will put a delivery card through your door so that you can contact the courier directly and arrange a more convenient time to deliver to you. 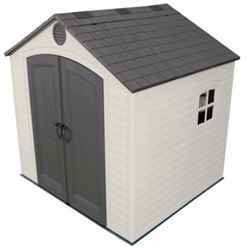 Our plastic sheds are delivered flat packed and boxed. The number of boxes you will receive is dependent on the size of the building you have ordered. The boxes will be fairly heavy so please ensure you have someone to help you lift the boxes where you require them to go. 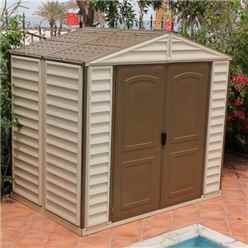 Our plastic sheds do not include an assembly service as standard. 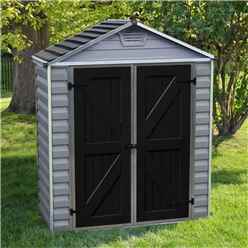 However, we do offer an installation service on selected plastic sheds. 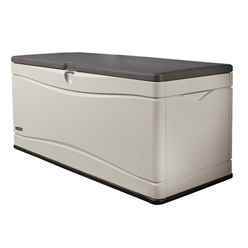 If installation is available, it will be listed in the additional extras on the product page with the additional cost of the assembly service listed. If you cannot find this easily or if it isn’t clear if the product includes the installation service, please do not hesitate to contact us. Our installation team have over 25 years’ experience, are trust worthy and reliable. The installation team will provide you peace of mind your building is being carried out to the highest standard possible. If you are carrying out the assembly of your building yourself, we recommend at least two people build so that one person can hold each part and the other person can fix the parts together. You will receive all the fixtures and fittings for you to build your product and also the full instruction manual. 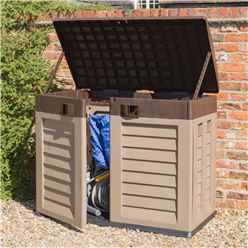 Whether you have gone with our installation team to carry out the assembly or if you are doing it yourself with the help of a friend, we highly recommend your base you’re your new building is prepared prior to you receiving your delivery. 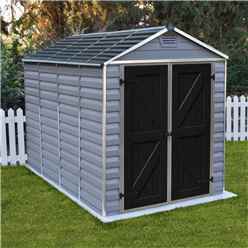 Our plastic sheds are made from Polycarbonate panels and Aluminium framing. The panels being virtually unbreakable and the framing is rust resistance. 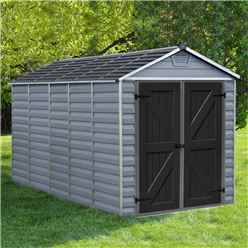 Providing a strong, long lasting shed that will last you many years to come. 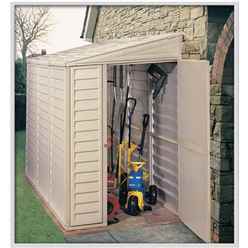 Due to the materials our plastic sheds are made from provides you a maintenance free garden building. 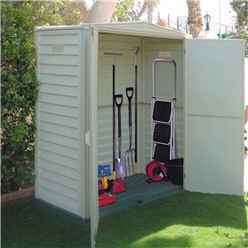 All of our plastic sheds include the full fixing kit and instruction manual to assist you with the installation of your new building. We also include a warranty of all of our products. Please see product listings for the length of the warranty on each item.